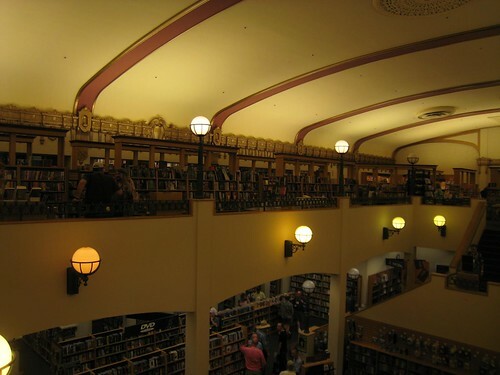 A little over thirty years ago, I made my first trip to Palo Alto. 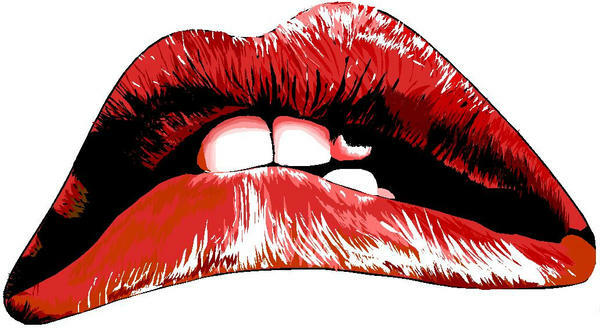 I lived in a little town called Moraga in the East Bay, and some friends of my girlfriend (now my wife) were going to see The Rocky Horror Picture Show. I had never seen the movie (and if you know Rocky Horror, you know that you don’t really just sit there and watch it), and I had never been to Palo Alto. So, one night during a senior year in high school, off we went. 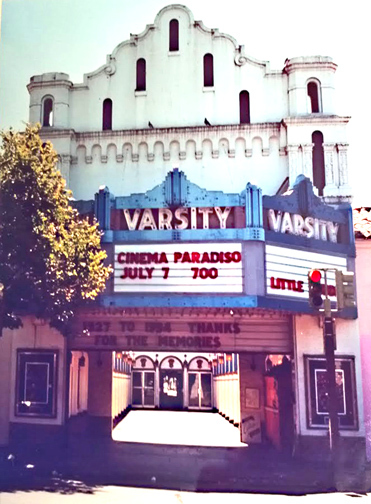 The place where they showed the movie was the Varsity theatre, a venerable cinema on University Avenue which had been there for decades. I had a great night, and I was practically rolling with laughter in the aisles from the movie. It was a very positive introduction to the town that would later become my home. Well, the Varsity didn’t show movies for many years after that. Running a movie theatre on one of the most valuable retail lanes in the San Francisco area was an economic mismatch. The revenue from ticket sales couldn’t cover the rent on such a huge place, so eventually it was shuttered. The theatre sat, padlocked and empty, and it sat like a relic to an era of young fun nights and four dollar movie tickets. It wasn’t shut down forever, however. Borders Books took over the spot, and they transformed it into a really amazing retail space. The interior still had the look of an old theatre: even though the screen and seats were gone, you could stand in the middle of the store, with its gently curved high ceiling and grand steps up to the balcony, and remember how it used to be. I visited Borders countless times, and in those pre-Amazon days, it was often crowded with Palo Altans reading and buying the latest books. This, too, was not a permanent situation. Times change, and rents keep going up, and even after a long run, Borders couldn’t keep the place open anymore. Thus, after many years in business (with the beautiful movie marquee surrounded by neon lights still intact), Borders shut down its Palo Alto store. The padlocks returned. 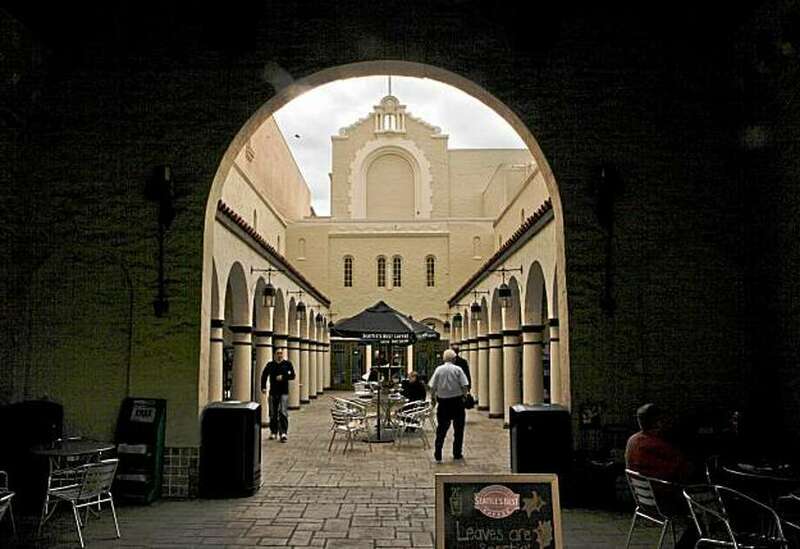 The hiatus lasted even longer this time, with the Mediterranean style courtyard leading to the theatre gathering dust and birds’ nests over the years. As valuable as the property was, it was surprising that it would sit idle and revenue-free year after year after year. 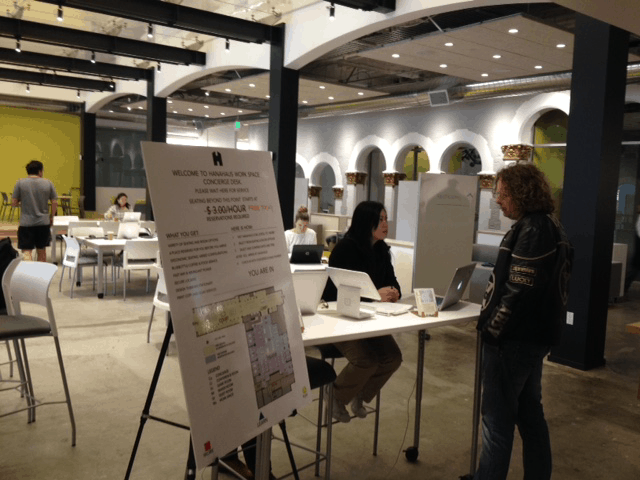 What’s HANAHAUS, you ask? Well, I’m here to tell you. It’s a place where you can walk inside, buy a coffee-based beverage, sit down, hang off the WiFi, and get some work done. A community of purpose defining a new café experience where creative individuals and entrepreneurs can come together to meet, socialize, share ideas and connect with experts. The business model seems to be selling seats (by the hour). Now, to be sure, it’s pretty nice inside. 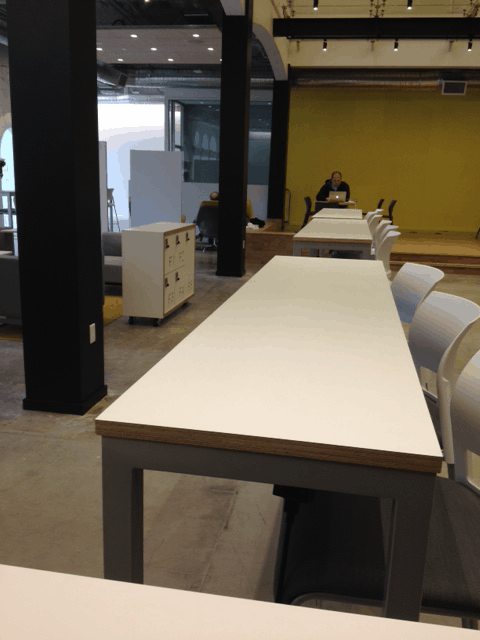 There are rows of high tables, and sofas, and relatively comfortable-looking chairs. 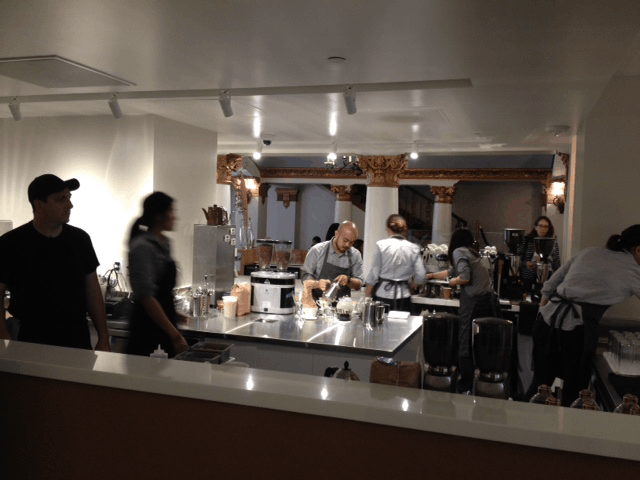 And it’s clear that many hundreds of thousands of dollars (if not a million or two) have gone into completely refurbishing and updating the interior space. There are even glass-walled meeting rooms. There were a couple of employees at a welcome table, shown below, trying to explain what on earth this place was all about. I suspect many of the people who came in, like me, were wondering what transformation had taken place inside the ol’ Varsity (where, although the ceiling is now an extraordinarily-expensive looking all-glass affair, one can still plainly see the aforementioned arched ceiling of the original theatre). You can make out in the sign below that someoneused an erasable marker to strike out the normal $3.00/hour price and wrote “Free Today” next to it. I suspect this bargain is going to be intact for a little while. 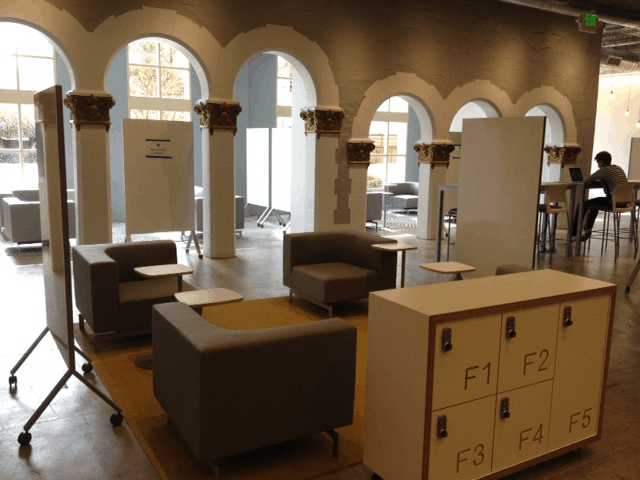 Yet, again, for all the outstanding design choices, cleanliness, and high-end (Blue Bottle, naturally) coffee beverages, a visitor would have absolutely no trouble finding a place to rest their high-tech bones. Suffice it to say it’s going to take a lot of $3 per hour charges to offset this investment and ongoing expense (and even more $0 per hour charges). But I don’t mention all this to point out the challenge, to say the least, this business surely is going to face in the months ahead. A couple of different things spring to mind. First, I’m reminded of the last time anything resembling an “Internet Cafe” showed up on University Avenue. It was in something like 1998, I believe. They charged much higher prices than $3/hour, and the big appeal at the time was that they had – gasp – Internet access. Even in Palo Alto, in those days the Internet was still something of a novelty, and a lot of people didn’t really know how to get on it or use it. So this place (whose name obviously escapes me) had set up computers with wired Internet access and visitors could………forgive the trite phrase…….surf the web. I think they were in business for something like ten weeks. 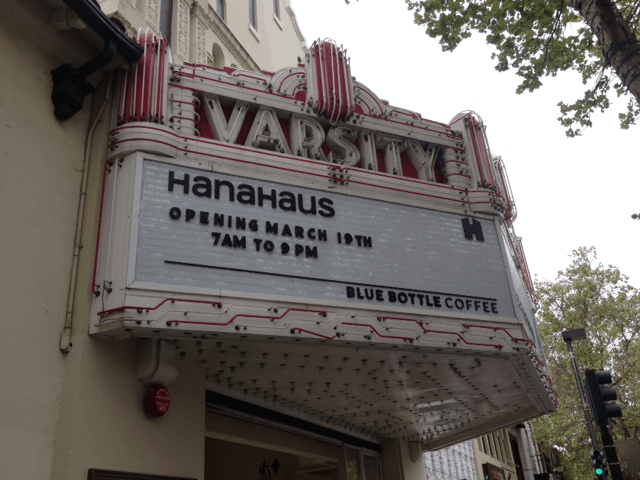 Second, and more importantly, I think the appearance of HANAHAUS is yet another cultural marker, another saturation point, in my fair city. The appeal of this place isn’t that it has coffee (God knows Palo Alto has enough coffee shops) or that it has WiFi or even that it has seats whose cushions are, to date, unstained. The notion seems to be that anyone can walk into this magical little realm and, who knows, create The Next Big Thing. You can meet people there – perhaps planned, perhaps by accident – dream your dreams, code your code, and make your fortune. It’s an ad hoc incubator for the public. A place where, just as anyone going to Hollywood can be a star, anyone who can put lines of code together can make the next WhatsApp, Instagram, or God-knows-what-else. This zeitgeist is echoed a couple of miles south, still here in town, where a nicely-decorated storefront called CODER’S ACADEMY has opened. It’s in the same vein as the franchised SCHOOL OF ROCK, and forgive me for being so cynical, but I find it achingly touching (and, frankly, exploitative) that businesses want to milk the dreams of children about being a rock star (or programmer) with these establishments. There’s something almost cruel about it. That’s just not how these things happen. I know the history of all the firms, and I’ve got a pretty good sense as to where tech talent comes from. It isn’t from visiting a franchise. Honest. Well, this will all sort itself out eventually. I can offer you my most solemn assurances that the Varsity will see those padlocks return, and the Coder’s Academy will stand vacant, waiting perhaps something more normal like a bagel shop or insurance office to fill its space. In the meantime, just as at the height of the Internet bubble, those unfortunate souls like myself who have not yet gone stark raving insane have to keep cringing through this lunatic era. This isn’t 1999 all over again. It’s much, much worse. Promise.